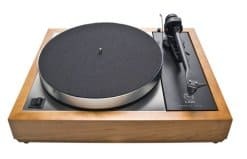 For 30 years plus the Linn Sondek LP12, has been ‘the’ turntable of choice for vinyl Audiophile listeners. We have been retailing Hi-Fi for over 25 years and still the LP12 comes out on top with our customers. We have an onsite Linn trained engineer, and we can also upgrade, service or repair any Linn record player LP12 regardless of the age of unit.